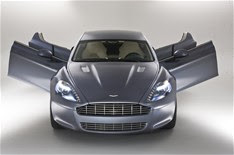 The Aston Martin Rapide will cost from £139,950. That compares with £95,298 for a top-spec Porsche Panamera 4.8 V8 Turbo PDK and £89,860 for a Maserati Quattroporte 4.7 V8 GT S.
Standard kit in the four-seater will include a Bang & Olufsen sound system, heated memory seats and dual-cast brakes, and it will feature an adaptive damping system. The Rapide is the first Aston to be built at the Magna Steyr plant in Graz, Austria, with each car taking about 220 man hours to build. Deliveries will begin from March next year, and Aston is predicting 2000 sales a year.